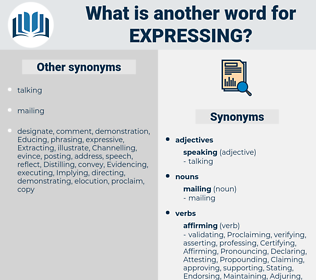 What is another word for Expressing? Gestures, representations, remarks, indications, overtures, expressions. 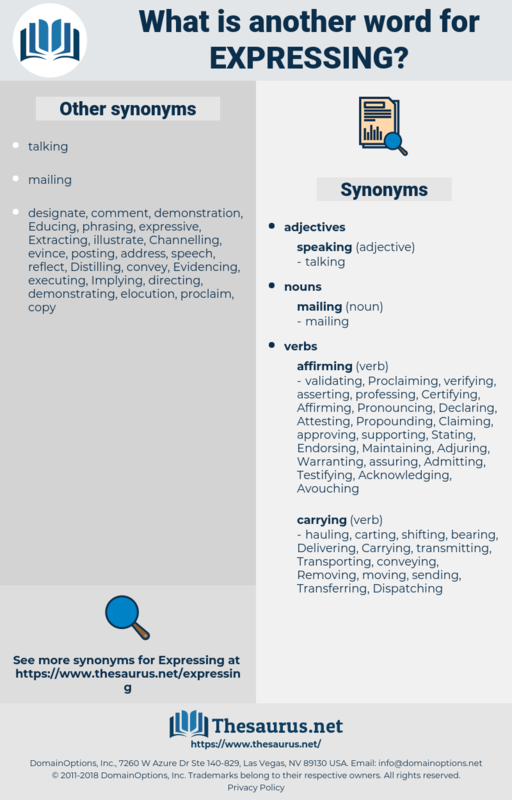 stressing, Proposing, demonstrating, Addressing, Explaining, Reiterating, Congratulating, reaffirming, Exposing, Acknowledging, Appreciating, Articulating, Testifying, representing, asserting, Illustrating, Experiencing, Describing, protesting, conveying, understanding, Translating, Proclaiming, Expecting, reporting, supporting, concerning, Considering, Thanking, Declaring, Indicating, interpreting, issuing, Pertaining, Respecting, Manifesting, Presenting, reflecting, underscoring, observing, recognising, circulating, Transferring, Specifying, communicating, Recognizing, Affirming, publicizing, Exhibiting, Proving, confirming, commemorating, Suggesting, Delivering, crossing, rendering, performing, emphasizing, forwarding, saying, emphasising, Referring, recording, passing, offering, recalling, Realizing, Pledging, identifying, formulated, Formulating, welcoming, Discussing, Attesting, voicing, disseminating, Constituting, Hoping, revealing, publishing, posing, Registering, Witnessing, Whereas, informing, ruling, Stipulating, bearing, complaining, Invoking, showing, feeling, underlining, determining, illuminating, sending, sharing, shaping, Signifying, Designating, directing, transmitting, Producing, telling, display, Displaying, agreeing, wishing, seeing, Introducing, raising, Comprising, Noting, arguing, Mentioning, contributing, Arising, Conferring, Announcing, relocating, Evoking, Enforcing, disclosing, defining, emerging, Embodying, pretending, Submitting, develop, developing, Generating, Implying, ranging, Citing, clarifying, paying, Receiving, airing, Relaying, upholding, provide, Providing, setting, showcasing, targeting, Alleging, devising, hearing, being, Were, posting, Signalling, releasing, Creating, filing, wording, moving, Involving, opting, highlighting, drafting, Outlining, Committing, squeezing, designing, giving, detailing, Treating, contending, insisting, broadcasting, Elaborating, Carrying, shifting, framing, casting, know, knowing, Applying, Levelling, Everything, asking, marking, Commenting, waiting, Adding, keeping, Occurring, believing, Stating, Containing, causing, collecting, featuring, Linking, glaring, pointing, emitting, voting, viewing, driving, Awaiting, lodging, Granting, Injecting, listing, entering, guiding, drawing, Forming, focusing, holding, bringing, Maintaining, putting, Allowing, Having, yielding, leading, Evidencing, Claiming, looking, sounding, according, finding, talking, table, Tabling, taking, marching, going, watching, dealing, contact, contacting, figuring, event, thinking, conducting, calling, Doing, getting, making, name, names, naming. This much I will say and will refrain from expressing the rest of my thoughts here, so please your Reverence. He was a very serious gentleman, who gave Pascualet courage with his kind words, looking intently at him all the while, and expressing regret that he had waited so long before coming to him. espresso, expressage, echovirus, express joy, expressway.